The perfect, low-maintenace solution for colourful groundcover - keeps weeds at bay once established. Hardy and colourful - 4 colours shown included in each collection. Each plant spreads to 60cm (2ft) in 5 years or so, and blooms every April and May. Perfect as a carpet en-masse, or dot around under trees or in gaps in mixed borders. Supplied as a pack of 12 jumbo plugs - 3 each of colours, to plant straight out. 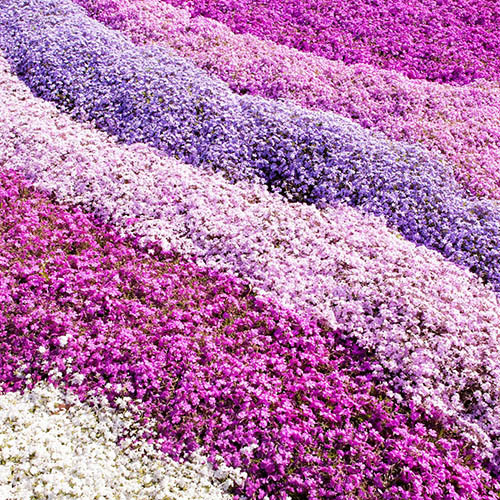 The perfect solution for colourful spring groundcover, creeping hardy carpet Phlox is a low or no maintenace solution, that spreads evenly for lovely colourful spring displays. Each plant will spread to 60cm (2ft) across, so plant them in drifts for a carpet of colour, or dot around to fill gaps and keep weeds at bay. Great in spots in full sun, in rockeries, or mixed borders, just avoid very wet winter soil. You will get 3 plants each of the best 4 colours - white, red, pink striped and lilac blue. Supplied as 12 x jumbo plugs, 3 each of 4 colours. Clip plants lightly immediately after blooming to encourage dense growth. Requires good drainage. Drought tolerant, once established. Feed and water regularly, particularly during dry periods, until the young phlox plants are fully established.